Co-Developed by Quan and Mission One, Emotipon Features a Refreshing Take on the Puzzle Genre and over 200 Super-Cute Characters to Collect. 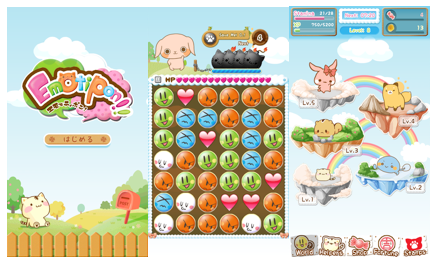 July 3, 2013 (TOKYO) — Veteran Japanese smartphone development studios Quan Inc. (CEO: Kazuhiro Mizuno) and Mission One, LLC (CEO: Marc Cellucci) are proud to announce the release of “Emotipon,” an all-new style of puzzle game targeted towards the casual gaming market. Emotipon is based on a uniquely Japanese invention that’s swept the world — emoticons. It blends emoticons with puzzle and RPG elements, to create a completely unique game targeted at light users (especially women) all around the globe. Emotipon can be picked up and played in less than a minute. 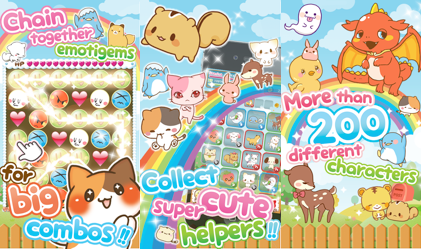 Simply connect “emotigems” together in long chains to score big combos and rescue over 200 unique, hyper-cute helper characters. You can take these helper characters into each puzzle stage for a variety of bonus effects, and there are 10 worlds packed with stages to explore. Additional features include a daily drawing to get random helper characters, a stamp card that you can trade in for big bonuses, and much more — with even more on the way. An Android version of Emotipon will be available in August, and a variety of updates, including new stages, characters, events, and interoperability with Quan’s popular “Lounge” social network application are all on the way. Emotipon is currently available in two languages, English and Japanese. ■ Published by Quan, Inc. Established in August 2011 by former Tekunodo CEO Kazuhiro Mizuno, Quan focuses on service planning and the development of smartphone and web applications. Their “Lounge” chat application as well as their “Sticker Maker” line of apps have been downloaded over four million times, with 60% of downloads coming from overseas markets. In May 2013, they announced a partnership with AIS, Thailand’s largest mobile carrier. Founded in June 2008 by video game veteran Marc Cellucci, Mission One is based in Tokyo and focuses on two main business areas: smartphone application development and the localization of Japanese entertainment content.